This ‘recipe’ was inspired by a very decadent macaroni, cheese and bacon dish I ate in the far north of Scotland last year. This recipe is more about technique than about exotic ingredients. I use the microwave to cook nearly all my vegetables and have for many years. If you rinse your vegetable pieces and drain them of all but the water that clings to the veggies, this will be enough water to steam them in the microwave. For this amount of cauliflower I cook, covered, on high for about 90 seconds, stir, let sit for a minute, then cook for another 30 seconds on high and test for doneness. If need be you can cook for another 30-60 seconds, but don’t make it into mush, you just wanted it cooked to tender. Let it rest for another 30 seconds and fork test it, and if it seems tender, it’s done. Remember things cooked in a microwave will cook a little bit more once you take them out. Every microwave, just like every oven, is different, and so you have to get to know what your microwave is like. 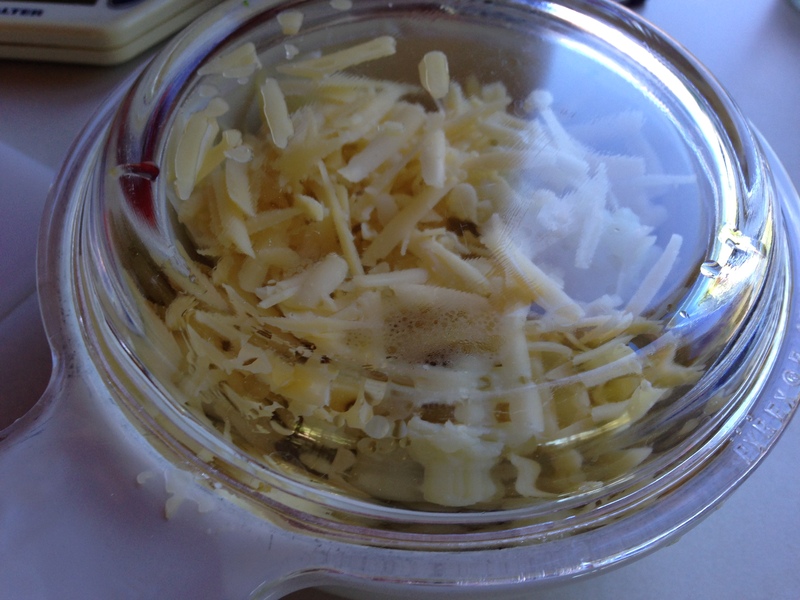 When you remove the lid to test it, try to be fast about it, and have your cheeses ready to go. The residual heat in the veggies will melt the cheese, so pop the cheese on top and replace the lid to hold the heat in. 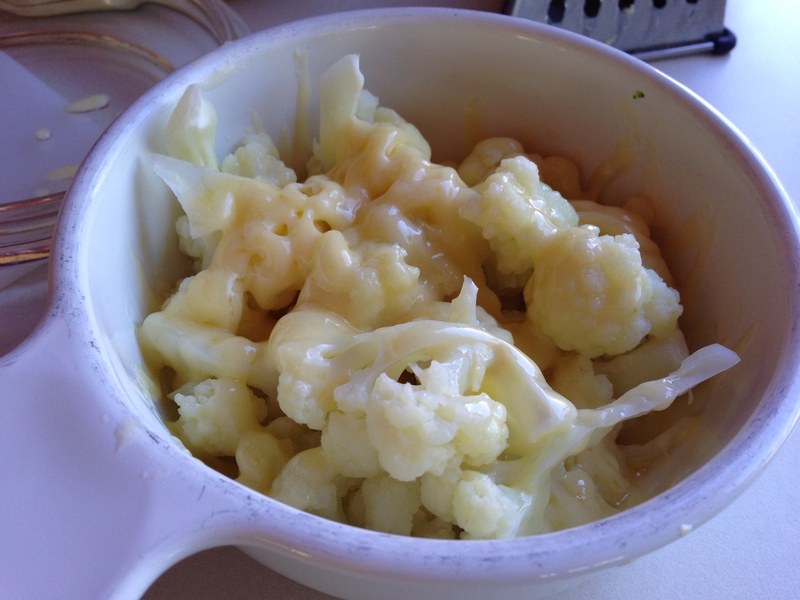 In about a minute the cheese will be melted over the cauliflower like a perfect cheese sauce. While the cheese is melting, chop the ham. Move the cauliflower cheese onto a plate and season with pepper. 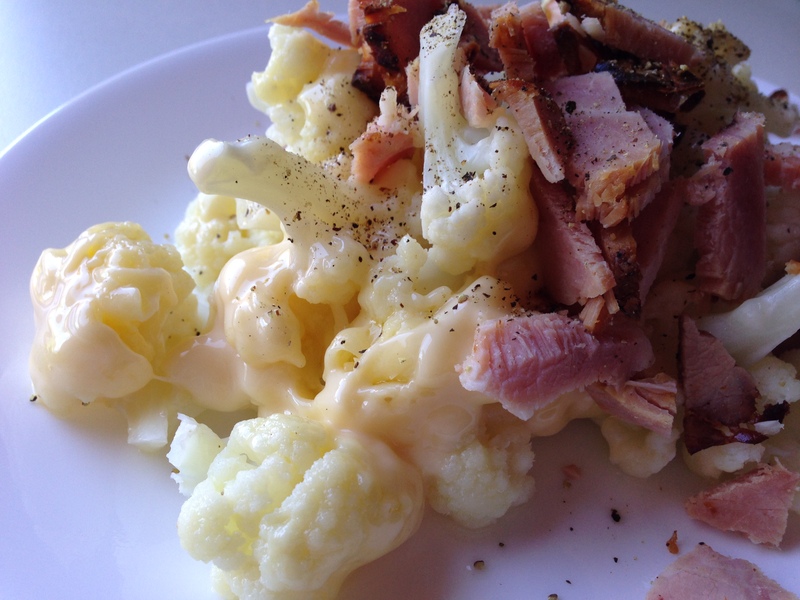 Sprinkle the ham pieces over the cauliflower. You won’t need salt because the cheese and the ham have enough in them. This is so creamy and delicious, you will have trouble convincing yourself you are ‘allowed’ to eat it! This sounds yummy. Cant wait to try it.